We are very sad to announce the death yesterday, November 2nd, of Peter Markey, aged 86. 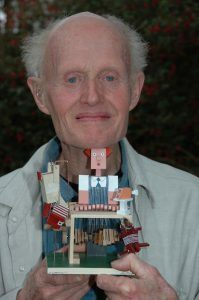 Peter was the first automata artist to start making work for us in 1979 and he continued to make automata for almost 50 years. His deceptively simple style and insistence on using the most basic materials belied his ingenuity as a maker. Peter’s creations continue to inspire new audiences and we will always remember his exuberance and vitality. Image: Peter Markey on his 75th Birthday, (2005) with a gift from and made by Paul Spooner. Sad – a very distinctive artist whose clarity of mechanisms and colour schemes have had a great impact on the automata world.